St. Patrick's Day is only a few days away! If you are still deciding what snack or treat to make for your little ones, here is a quick and easy printable that can make a regular sandwich or snack bag more festive. These would be perfect to bring to your child's class. I filled a little snack bag with Lucky Charms, but there are lots of fun things you can fill your bags with. Download HERE, print on white heavy cardstock paper, cut out each label, and staple over a sandwich or snack bag. Enjoy! So cute! Love your blog :) Keep it up! Thanks so much for posting the printable! I had been looking for something really cute to send to my sons' preschool classes for St. Patricks Day and this is absolutely perfect. PS - I found your printable on ishareprintables.com. Thank you so much! 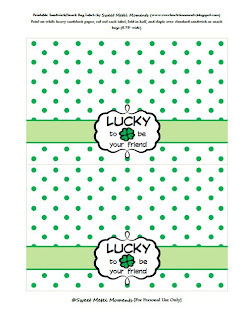 Using for a St. Patrick's Day birthday party! !